The benefits and appeal of owning a business jet are inarguably far reaching. More time spent with family. ‘Mobile office’ capabilities resulting in better focus and productivity. Additional exclusivity, privacy, and comfort. Business jet ownership is the epitome of convenience with a delicate dash of simplicity and luxury. From the initial curiosity of buying—to stepping on one’s personal aircraft for the first time— a few considerations must be made before the dream of ownership is a reality. Buying a business jet is a multi-step process that is best guided by an aircraft sales broker— the professional who exists to find the perfect jet fit for an interested client. A broker fulfills a larger role than simply ‘jet-matchmaker,’ but remains an integral part in a positive buying experience and outcome. An aircraft sales and acquisitions broker can connect buyers to the right sellers, find the best aviation attorneys, and offer direction to proper management options; along with posing additional thoughts and acting as a client’s advocate. When working with a reputable broker, buyers can be confident that whatever parameters or features desired, the broker can smoothly facilitate the evolution of buying a jet. Often, potential owners have a nebulous idea of what questions to ask regarding their next aviation asset. Clay Lacy Aviation market research analyst, Justin Sherrill, mentions that one of the most common questions buyers will pose is, “What is the range of this jet?” Knowing the range is a valid inquiry, but learning that a Gulfstream G550 can fly approximately 6,750 nautical miles is not the underlying concern. “What the client really wants to know,” continues Justin is, “Will this jet fly from Los Angeles to London or Kona non-stop?” Every buyer will ask relevant questions, but when working with a knowledgeable professional, the resulting answers are more likely to be pertinent and beneficial to a client’s goals. The questions and answers offered lead to the next step of ‘research’— an essential component in aircraft acquisitions. The sales and acquisitions team at Clay Lacy is adept at listening to a buyer’s wants and needs and then translating that into in-depth market research. The amount of time spent in research— to purchase an aircraft— can range anywhere from a few days to a few weeks; depending on the specifics outlined by a buyer. One of the benefits of using a reputable broker is the ability to access both on-market and off-market aircraft listings. Brokers can leverage their relationships with other brokers, on a global scale, to find the ideal aircraft. By having an ability to filter through every available listing— both on and off-market— brokers are able to present the best opportunities to their clients. “As a market research analyst, I take the specific parameters that a client communicates and begin making calls, all over the world, to see what jets are available. I gather the knowledge and share it with our in-house team. At that point, I can return to the client with specific aircraft options that are of highest interest,” says Justin. At Clay Lacy, the progression to jet ownership is skillfully orchestrated all in one place. 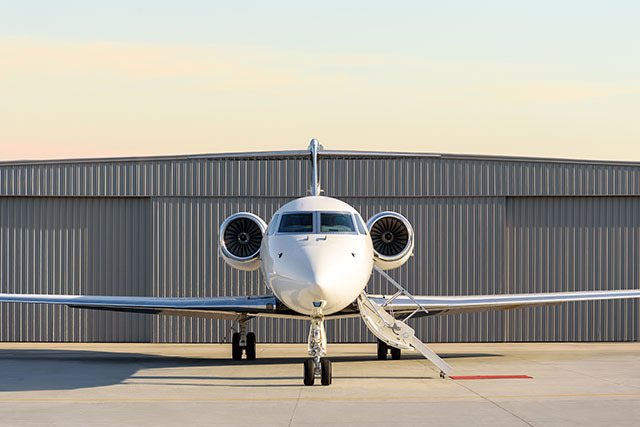 “What is ideal for aircraft owners here, is that we are able to provide for all of a client’s aviation needs,” says Daniel Harris, Regional Sales Manager of Charter at Clay Lacy. Interested in the benefits of a dedicated market research analyst to help you find, own and enjoy your ideal jet? Contact an aircraft sales & acquisitions expert today. Get tweets on news, events and insights.